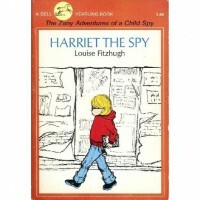 This was the book that really turned my life on!Harriet is staunchly independent, irreverent, observant, passionate, intelligent, a fully formed radical feminist character. It was read to me by a teacher that dared mention feminism in our first grade summer school class. I got sick and could not finish the summer session, but I liked it so much I sought it out and read it myself--which started my career as a reader, a writer, and a feminist simultaneously, at the age of six. I think the teacher was later fired for being a feminist in our staid, buttoned up school district.This book is also, symbolically anyway, the story of Louise Fitzhugh, herself a great revolutionary figure, a fairly open lesbian.And I suggest reading this in the original edition, if you can get your hands on it, the illustrations, done by Fitzhugh herself, do much to transport you to the feel and the setting of this book, New York in the late 60s, early 70s. The newer editions, with their "nicer, more feminine" looking covers, seem to mill out all the personality, and one wonders if the contents themselves are similarly compromised.